"Stand by for Dragon Ball Z! Coming next..."
— English narrator, introductory bumper. Dragon Ball Z is the anime adaptation of the last two-thirds of Akira Toriyama's Dragon Ball manga. 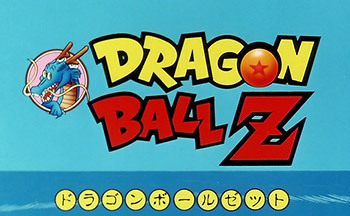 While the manga kept its original name throughout its run in Japan, the anime's title was changed from Dragon Ball to Dragon Ball Z in 1989, and the focus had changed from a Martial Arts Comedy series (inspired by Journey to the West) to more serious and violent battles (and Toriyama thought it would be ending soon). As such, Z, is often used to refer both to the anime and this portion of the manga. At the start, it's revealed that Goku was not simply a boy with a tail but one of the last of the alien race, the Saiyans. He was sent into space shortly before the Saiyan planet was destroyed (with shades of Golden Bat, Prince of Gamma, and Superman). Goku and his friends, reinforced by former enemies (a recurring theme) had to fight progressively more powerful villains. Although Goku and his martial arts skills (which let him and his friends fly, throw energy blasts and read minds) dominated the battles, the story focused more on Goku's son Gohan as he grew up. Running seven years and nearly 300 episodes, the series can be broken down into the four primary big bads of the series: Vegeta, Frieza, Cell, and Majin Buu. Both Dragon Ball the manga and Dragon Ball Z the anime came to a triumphant conclusion after Gohan marries a woman named Videl and their daughter, Pan enters the "Strongest Under the Heavens" tournament. Followed by Dragon Ball GT, which was an original story not based on the manga and had minimal involvement from Toriyama, which facilitated a lukewarm response. The series was bought by Funimation for an English dub, which started in 1996. The enduring popularity of the series eventually led to Dragon Ball Kai in 2009, a more streamlined edit that removed most of the aforementioned filler. This sub-series spawned a MMORPG continuation known as Dragon Ball Online for a time, but also spanned fifteen theatrical movies and two special tv episodes. The first thirteen movies are non-serial movies that primarily reflected the concurrent story of the show. The fourteenth movie, Dragon Ball Z: Battle of Gods, made years later under the direct involvement of Toriyama, is a canonical continuation to the manga and set some time after the Buu Saga. Dragon Ball Z: Resurrection F was a direct sequel, and the wild success of both films led to Dragon Ball Super, a whole new series set between the Buu arc and Z's Distant Finale.